The FC300 Series channels are 300 mm in width, 450 mm in height, and are available in 2.5, 5, 7.5, 10, 12.5 and 15 metre lengths. 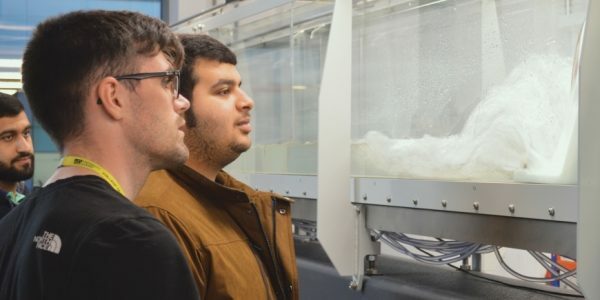 The flumes have various models available, giving students have a wide choice of experimentation in open channel flow. The flumes have a built-in re-circulating water supply connected to a digital flow metre for accurate measurements during experimentation. The flumes have pressure measurement tappings at 0.25 metre intervals along the working section. These tappings can connect either to a multi-tube manometer or to a 32-way pressure display. 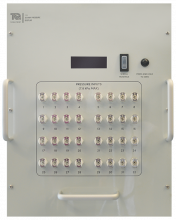 The 32-way pressure display connects to TecQuipment’s VDAS® for real-time data acquisition. 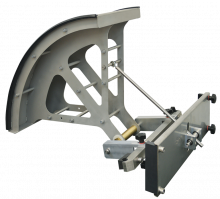 Each FC300 is supplied with two level gauges (hook and point) and a Pitot tube, all of which mount onto and run along the instrument rails at the top of the flume. Measurements from these instruments combined with the digital flow meter provide the potential for extensive analysis of open channel flow for research or advanced study. 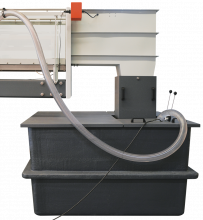 Bed-load transport can be investigated using the optional Sediment Loop (FC300sl). 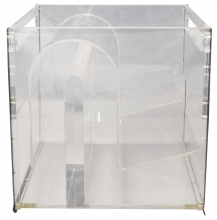 This ancillary provides a closed sediment circuit consisting of a sediment trap and feed mechanism which allows sand to be pumped from the trap to a feeder located above the working section between experiments. The flume is made of transparent glass, precision-built to ensure parallel walls and a consistently accurate cross-section along its length. 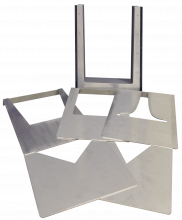 A sturdy steel square-section firmly supports the channel throughout its length. It has a floor-standing frame that supports the working section at a convenient eye-level position for students. Screw jacks raise and lower the supports inclining the channel as required. The digital inclinometer gives an accurate display of the channel angle. A pump with a speed controller, forces water up to the flow settling chamber at the upstream end of the channel. This gives smooth, uniform flow, free from entry effects. Sluice gate for investigations into hydraulic jump, specific energy and the determination of discharge coefficient. Submerged sharp-crested weir reveals the relationship between head over a weir and discharge. A broad-crested weir and the effects of changing the profile of the weir (optional ancillary). Uniform flow in an inclined channel with investigations into the Chezy factor and coefficient. A Venturi flume to indicate the discharge and surface profile, thus the derivation of the discharge coefficient. Further experimentation with additional optional models. 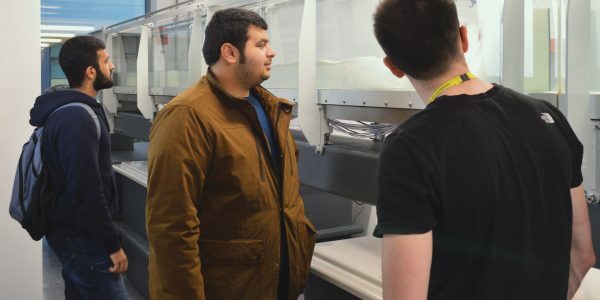 Reliability, expansive functionality, customer service and competitive price were the main reasons why the University of Derby chose to invest in a sizeable piece of fluid mechanics equipment from TecQuipment. 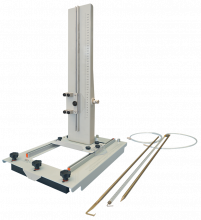 A radial section gate for experiments to demonstrate the head/flow and discharge characteristics of a radial gate. For use with an FC300 Flow Channel, not included. A sluice gate with ten tappings across its face. Enables students to investigate changes in pressure across the face of a sluice gate; also how the pressure varies with flow rate and depth. For use with an FC300 Flow Channel, not included. A crump weir model to demonstrate alternative flow measurement techniques used in rivers and waterways. For use with FC300 Flow Channel, not included. 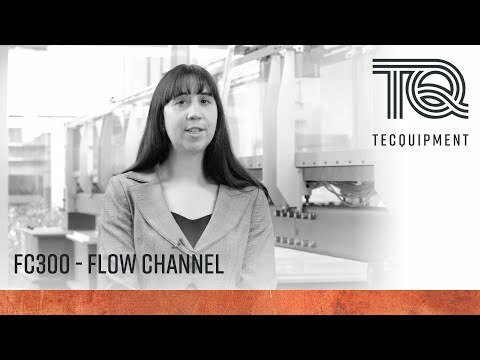 The notch weir set works over a range of flows to allow experiments that show the relationship between flow and head and how the weirs can be used to measure flow. The apparatus includes a holder and three standard notches, one rectangular and two “V” notch. It also includes an advanced set of two notches, Cipoletti (trapezoidal) and a Sutro notch for more experiments. For use with FC300 Flow Channel, not included. TecQuipment’s broad crested weirs consists of two model weirs sufficiently wide to prevent the jet from springing clear at the upstream corner. 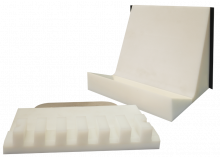 The models supplied are one block with rounded upstream and downstream corners and a similar block with sharp edges. For use with FC300 Flow Channel, not included. The spillway comes in four parts: the spillway, detachable ski jump and plain apron with removable toothed block. It is used to observe and calculate flow and energy dissipation over spillways. The spillway can also be used with the Energy Dissipation (FC300e3) to extend the range of possible experiments. For use with an FC300 Flow Channel, not included. Similar to the Spillway (FC300e) but with the addition of ten pressure tappings placed over the crest and face of the weir. The tappings are connected to a suitable Manometer (FC300w) or 32-Way Pressure Display (FCA1). It is used to study the pressure differences over the crest and face of an Ogee weir. The spillway can also be used with Energy Dissipation (FC300e3) to extend the range of possible experiments. To be used with either the Spillway (FC300e) or the Ogee Weir with Tappings (FC300e2). The apparatus consists of a long apron and a selection of toothed and solid blocks that can be arranged in any combination on the apron. For the study of the dissipation of energy. A clear acrylic spillway that demonstrates the effect of a siphon spillway and the increased flow permitted when compared with an ordinary spillway of a similar height. 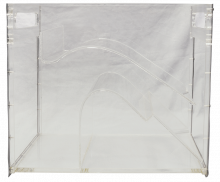 A clear acrylic, self-regulating siphon that demonstrates the automatic adjustment of its discharge over a wide range while maintaining a mostly constant water level upstream. The siphon passes a mixture of air and water. A pair of sediment walls and four differently profiled bridge piers. The apparatus is used to observe the increased flow velocity and the streamline curvature between the piers. Also scouring of the stream bed. The vortex shedding apparatus demonstrates that the drag force of water induces a suspended pendulum to shed vortices from alternate sides (a Karman vortex street). 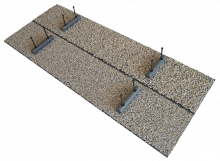 Two sets of 3 x 1500 mm weighted lengths of gravel flume bed (with removable handles to aid fitting and removal). The small grade gravel being 2-5 mm and large grade 10 mm. Used to simulate flow over roughened beds. grade used is 1–2 mm. Used to simulate flow over sandy beds. One set of 3 x 1500 mm weighted lengths of flume bed (with removable handles to aid fitting and removal). The bed is textured to resemble turf. Used to simulate flow over vegetated beds. A pair of Venturi sides to fit into the channel allowing demonstrations of flow measurement techniques used in rivers and waterways. A profiled base and sides to demonstrate how the flow in an open channel can be measured using a Parshall Flume. A pair of clear culvert models, one of circular and one of rectangular section. Enabling the observation and calculation of both open and orifice flow in a culvert. A clear acrylic 60° trapezoidal flume to enable the measurement of flows with the emphasis on low flow situations. 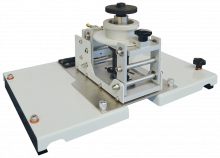 The FC300ld Lift and Drag module works with TecQuipment’s FC300 Flow Channel range. 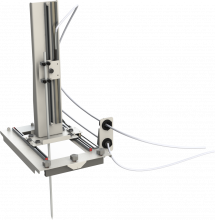 It provides a means to measure and display the lift or drag on a set of models consisting of two different sized cylinders and a hydrofoil. An ancillary that allows sediment to be re-circulated continually into an FC300 series flow channel from a sediment vessel located in the outlet tank. 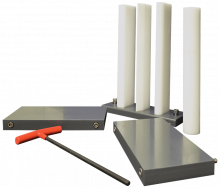 The instrument carrier can precisely place the tip of the supplied instruments at any position in the x, y, and z planes of TecQuipment’s FC300 flow channel range. 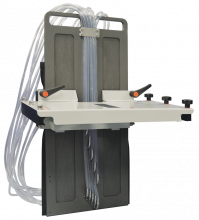 The digital instrument carrier can precisely place the tip of the supplied instruments at any position in the x, y, and z planes of TecQuipment’s FC300 flow channel range. This data can be monitored and recorded in TecQuipment's VDAS software. A 20-tube manometer for measuring pressure when using the FC300 series flow channels. It mounts onto the side of the FC300 on the instrument rails. A 32-way pressure measurement and display unit for use with TecQuipment’s FC series flumes (FC300, FC600). Handheld water velocity meter with display, for measuring water velocity at a point.